Home News Weather The traffic is bad, the weather is bad… be prepared today! The traffic is bad, the weather is bad… be prepared today! Ah, it’s just one of those days where you wake up and you’re like ‘NOT TODAY’, but yes, today. Traffic and weather really aren’t great today, so be prepared. This is honestly the best GIF ever. You may have already been caught in the bad traffic today, or about to brave it. But it’s looking pretty bad for most cities. This is likely due to the horrible weather we’re having today (so I don’t blame you for not cycling). I advise if you’re going anywhere within the next hour, stick on your sat nav to make sure you’re going to get there on time, in the major cities at least, the traffic is still looking really bad even now the major rush has gone. We gotta get used to this though, traffic jams are expected to get worse and worse in the Netherlands as time and years go by. There are far more cars on the road, so naturally, the traffic is going to get worse and worse. 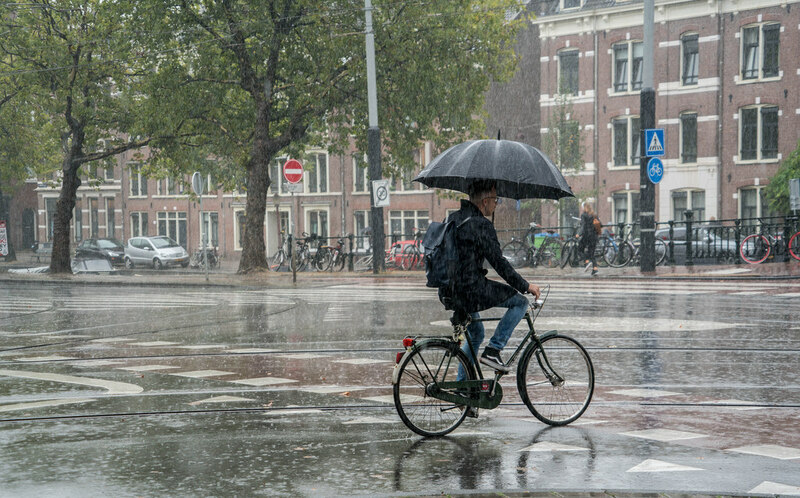 The weather today is finally typically Dutch. In short, it’s expected to rain all day for most of the country. Towards the south of Limburg, gusts of wind are expected to take hold throughout the day, so it’s not looking fun! The rain will eventually die down and we’re not expecting any heavy rain for the next week (maybe just a few showers), so it’s not all bad I suppose. Previous articleHow Amsterdam Became a Bicycle Paradise: Video Inside!